Just came off a weekend workshop with the remarkableTexas still life artist Qiang Huang. Two awesome days of instruction from one of the best there is! It was a little daunting, and after the first day I was really down on myselt. I won't share the painting I produced in our afternoon session. I was frustrated by my inability to apply the lessons imparted in the morning session, and was asking myself what I thought I was doing representing myself as an artist. But I pulled myself up by the bootstraps and showed up for day two, eager once again to learn what it is about Qiang's techniques that sets his work apart from the rest. We attended the lecture and presentation, then watched another demo. He is amazing to watch. His strokes are very well planned and deliberate. When he applies the paint, he knows it will be right and he doesn't disturb it once it's down. His paint application is thick and generous. I hope someday to have his confidence. I'm posting my day two still life study here, even though it has many problems, not the least of which are flaws in the composition. I would have arranged the objects differently from my viewpoint, but there were three of us painting at each station, which meant we all had a different view of the set-up we eventually arrived at. And I must remind myself that it is a learning tool, not a painting for exhibiting or sale. If you ever get a chance to take a workshop or attend a demo by Qiang Huang, I highly recommend it. He's one of the nicest people I've ever met, he is humble, he is an excellent teacher, and he is an awesome painter. 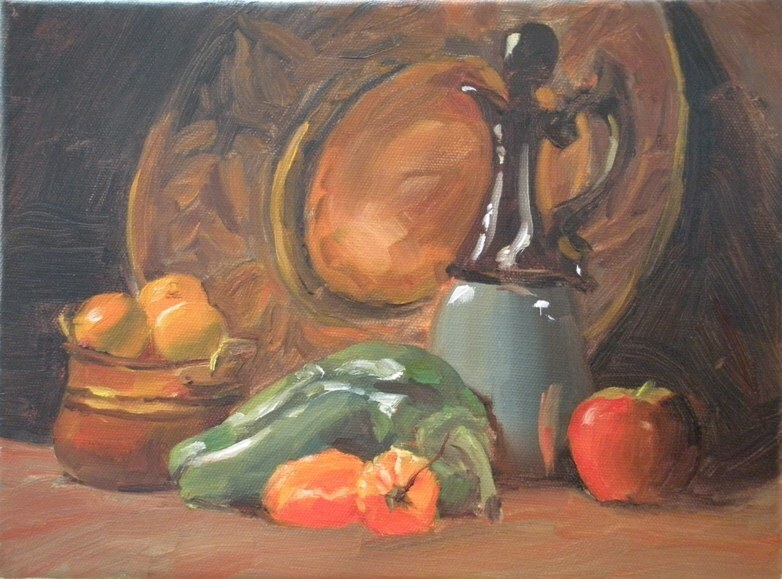 You can check out his website to see his paintings - still life, plein air and portraits. they're all wonderful.